The Digital Visual Interface or DVI is rapidly gaining popularity, especially with the rapid growth of digital displays like LCDs and LEDs. DVI is the definition of the whole interface but there are subcategories that define each aspect; one of these is DVI-D. The extra D in DVI-D stands for digital as it defines the digital components of the interface. To make it easier for people to realize that they are using an incompatible connector and not keep on wondering why their computer is not functioning, the designers of DVI modified the connectors and the ports. Since DVI-D ports lack the slots for the four analog pins, you should not be able to connect any other DVI connector to a DVI-D port. But even if you remove the four analog pins on the connector, you would still be unable to fit it in as the long flat pin of DVI-D is narrower; meaning that the slot on the corresponding DVI-D port is also narrower and cannot take other connectors. 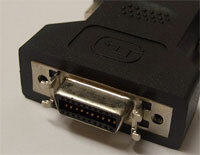 It is possible though to connect a DVI-D connector into a DVI-I slot or the universal slot that accepts all types of cables. This allows digital only LCD displays to connect to the universal port on the computer. Abishek. "Difference Between DVI and DVI-D." DifferenceBetween.net. May 19, 2011 < http://www.differencebetween.net/technology/difference-between-dvi-and-dvi-d/ >. Image, as i know, represent analog VGA, but not DVI interface.